A bill to eliminate South Carolina’s net metering cap has been an ongoing dispute over the course of the year. H.4421was proposed to remove the 2 percent net metering cap to ensure SC residents their right to clean energy without the restrictions made by utility companies. The Pro-Solar bill was thought to have passed with a majority vote 61 – 44 in favor of the bill. Unfortunately, House Speaker, Jay Lucas, R-Barrington, besought a technicality requiring a two-thirds vote in order for the bill to pass. The bill failed, and the net metering cap lived on. It was believed that this loss would delay the growth of South Carolina’s rooftop solar market. As people were witnessing this loss for the solar energy industry, the thought of the V.C. Summer Nuclear Power Plant was in the back of their minds. This debacle occurred when utility companies decided to pull the plug on a decade long nuclear power plant project, losing about $9 billion in the process. These same companies are influencing the limiting of customer choice and are threatening the future for renewable energy in South Carolina. With an increase in disapproval of the House’s decision from the public, about a month later on May 2, 2018, the House of Representatives passed a new bill, giving solar companies hope for the growth of the rooftop solar market. This new bill, HB 4950, raised the state’s net metering cap from 2 percent to 4 percent. This new amendment takes a step in the right direction but is not a long-term solution. In order for solar energy to truly take hold of the future, it is proven that the net metering cap needs to be eliminated completely to diminish the dependence of utility companies. The future for solar energy is very important in the state of South Carolina. So far, 69 solar companies have emerged, creating about 3,000 jobs in just South Carolina. 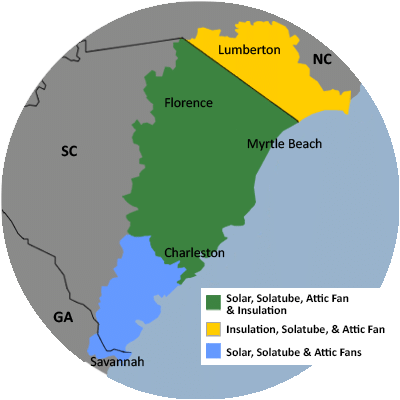 There is hope for solar energy in South Carolina. Tyson Grinstead states, “South Carolina has been, over the last 10 years, a state that has increased employment and has been known for being ‘open for business.’ We’re hopeful that the leaders of the state will make that slogan apply to solar as well as it does to other industries.” As this industry grows, we are hopeful that the state of South Carolina will put full faith in the future of solar energy.